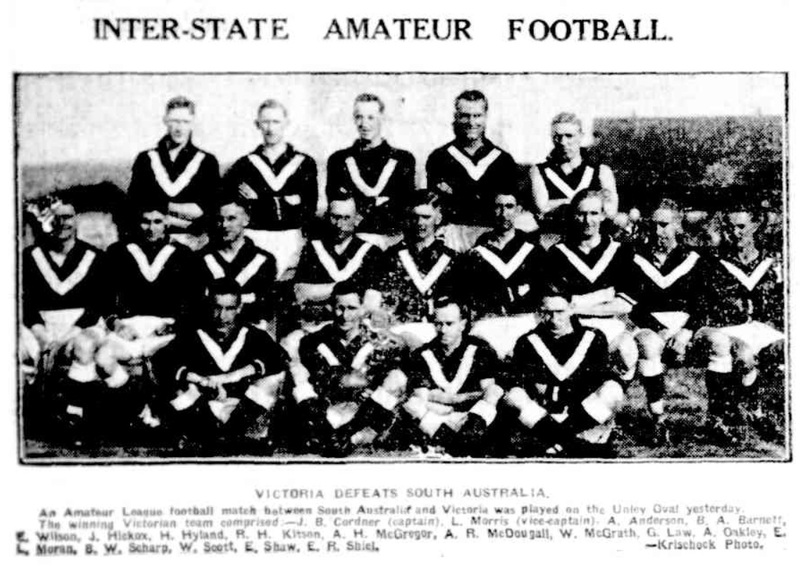 The VFL Seconds officially started in 1919, but prior to that date the Metropolitan Amateur Football Association (MAFA) essentially provided an unofficial seconds competition. The decision to move from the MAFA based system to having an official Seconds competition was taken during the First World War. The end of the University team in the League, the rise of the amateurs in the 1920’s and conflict over the WW1 fit into this story. In the 24 years between 1892 and 1915, 38 Clubs played in the competition with usually 10, but sometimes 8 or 9 clubs participating each season. There were a large number of clubs, around 20 in total, who played for five, or less than five, seasons. Collegians (1892) and Caulfield City (1894) were the mainstays of the early competition. Brighton (1892) was another early regular until 1908, when it moved to the VFA. Hawthorn 1902-1913 also played in the MJFA before moving to the VFA (and later the VFL). In 1896 the Metropolitan Junior’s elected their Second President, L.A. Adamson. Adamson held this position until his death in 1932. Born on the Isle of Man in 1860, Adamson studied at the Rugby school and later at Oxford. He moved to Melbourne in 1886 and began a connection with Wesley College (Collegians) and was the team’s delegate when the Association was established in 1892. In 1897, the first year of Adamson’s presidency the VFL played their first season. It was also a chaotic time at Wesley as in September 1897, Thomas Palmer was elected principal. Palmer then sacked all the staff, including Adamson, who had to move to University High School.2 Adamson returned to Wesley as Principal in 1902 where he stayed until 1932. The MJFA that Adamson inherited did not have a stable set of teams and there was a regular turnover of clubs. In Adamson's first years as president, 1897 and 1898, the competition shrink in size, but this appears to have been a decision to select stronger teams, as a number of applications to join the competition were rejected over this period (For the Love of the Game p24). Adamson was a proponent of the concept of Amateurism and the importance of amateur sport for character building of his students. This drive was a key factor in the coming years. These District and Junior clubs were based at the same grounds as the VFL team, and used the ground when it was not being used by the senior team. All MJFA premierships from 1904 were won by one of these VFL linked clubs. The first decade of the new century saw rise in strength and popularity of the competition, possibly because of the influx of stronger teams. MJFA match reports began appearing in the Argus in 1907 (For the Love of the Game p34) and the influx of better quality players led to a cap on the number of senior players (Those coming from the VFL, VFA, Ballarat League) etc. The ongoing link between the MJFA and the VFL brought stability and prestige to the MJFA, but it also brought risk, especially as the VFL continued to debate the issue of professionalism and player payments. At this stage all football competitions, including the VFL were amateur, but for Adamson and others in the private schools, Amateurism brought moral benefits in terms of how the game was played and these were incompatible with professionalism. In 1908 in New South Wales Rugby split over this issue. In 1908 the VFL expanded from eight to 10 teams, with Richmond and MJFA Premiers, University, joining the ranks. It was hoped that the University club would have been able to play on the large football ground at the University, but the University Council opposed the idea of walling off the oval so that admission could be charged.4 The club had to share the East Melbourne Ground with Essendon, later moving to the MCG. University awarded ‘Blues’ to members of its senior sports teams (in the tradition of Oxford University) and the senior team played in Black and Blue. University continued in the MJFA by fielding a Second’s team (which would later be named University Black’s). The decision to join the VFL must have been a controversial decision considering the shamateurism and player payment scandals in the VFL at the time and the split in Rugby. This uneasiness can be seen via the University Councils approach to the University football ground. In many ways the decision to promote University is hard to understand, from the perspective of the University and from the perspective of the VFL. Why did the VFL select an amateur based team to join the League, and select Richmond to join them? Why not an alternative candidate, such as the combined ‘North Melbourne – West Melbourne’ team from the VFA, especially as the rules on player payments were about to be changed and the University did not even have a home ground, or a suburban recruitment ‘zone’? In South Australia, the University of Adelaide had applied to join the SAFL every year from 1906 to 1910 but had been rejected because of the issues this would cause with the SAFL’s existing suburban Zoning system.5 In South Australia, this lead to the University being a leader in the establishment of an amateur league in South Australia in 1910. In 1907, the VFL would certainly have been aware of the failed applications in South Australia and also of the tensions in the rugby world. A major factor in the selection appears to have been the growing relationship between the MJFA and the VFL, but from the MJFA perspective this relationship must have been about defending and reinforcing the ideal of amateurism. The other side of the amateurism coin was the issue of class. Amateurism, at the time, was seen as a tool for reinforcing the social structures of the society. Was University was selected because they were the 'right people' rather than because they were the best long term choice? The original formation of the VFL only 11 years earlier gives some clues. The selection of University to join the VFL in 1907 as to be seen within the same context. The potential success of the University club in the VFL was destroyed by the 1911 decision by the League to allow player payments. The decision appears to have been unanticipated by the club and after a reasonable few seasons before this decision, the club soon became uncompetitive. Influential football writer Reginald Wilmot, better known as ‘Old Boy’, the Argus Football writer identified player payments as the key reason for the clubs exit from the VFL. In 1911 the VFL finally allowed player payments. This decision acknowledged publicly the fact that many star players were in fact already being paid. This decision was a problem for University and Melbourne, both purely amateur clubs. The impact of player payments was felt most heavily at University, but the Melbourne Football Club also fared poorly during this period. Melbourne were second bottom on the ladder in 1913 and 1914. At this time, the concept of Amateurism was still strong in sport. Grand Slam Tennis and the Olympic Games were separate amateur events and would remain so for many years to come. In early 1913, the American Jim Thorpe was stripped of his 1912 Olympic track and field medals for having taken expense money for playing baseball. This hard line amateurism probably had the effect of deterring potential players from joining University. The player payment decision also had a flow on effect with the MJFA. The MJFA had dropped the J from their name by the mid 1900’s and at the 1910 annual meeting of the Metropolitan Association, the President, Mr Adamson was able to state that “In view of the increase of professionalism in some circles of both senior and junior football, it is a matter for congratulation that the games of this association have been played on the strictest amateur lines.”10 Unfortunately for Adamson, the tide was swinging the other way. But privately he must have been concerned, especially with so many teams in his competition backed by professional teams. The tension can also be seen when Adamson (by then Headmaster as Wesley), refused to allow one of his staff (Gravenall) to play with the League as “the head master does not consider that with the game as it is played at present it is conductive to the best interests of a public school’13, almost certainly a comment by Adamson on the move to player payments. These actions by the MAFA put barriers between the VFL and the MAFA, ramped up tension and obviously caused resentment. It is unlikely that VFL clubs were happy with a situation where players had to wait four weeks between playing in the seniors and the juniors. Negotiations between the MAFA and the VFL in 1913 reduced the tensions, as the sit-out period was reduced from four to two weeks and permit periods were extended. (For the Love of the Game p39) The MAFA though made no moves to reduce the influence of the League on the MAFA teams, and also did not recruit any non-VFL based teams. The First World War began in August 1914, but it was not until 1915 with the landings in the Dardanelles, that the war began to have a large impact on Australian Football. Through 1915, as the League developed their district plan, the realisation was made that the war would require significant number of Australian soldiers. In the football world the debates centred on whether it was ethical to continue to celebrate paid sporting hero’s while the real hero’s had enlisted and were fighting the war. 1915 was the last pre-war season for many leagues including the VFA and the MAFA, but a number of clubs in the VFL wanted to continue. In very crude terms, the Working class suburbs were happy to continue with football. These suburbs/teams were also those most in favour of professional sport.17 On the other side, the ‘amateurs’ favoured closing down for the war. Clubs like University and Melbourne lost more players and ex-players as war casualties than the other VFL clubs, clubs like Collingwood, Richmond and Geelong were affected the least. He pointed out that the previous day’s Argus reported that (Carlton) have so many of last years premiership team that they have little room for recruits, while 18 men from the MAFA premiers South Yarra had enlisted. Adding comments that paid players (in the VFL) put football first and country second. The VFL response to the comments was not recorded by the papers, but in early December a wrinkle was added to the district scheme. Not only would there be a district scheme, but the VFL would institute its own junior League and allow professional players. The proposal was that the VFL backed teams in the MAFA would be asked to transfer to this new League. To reorganise the competition in the middle of the war was surprising...was this the Leagues response to Adamson's negative comments? The MAFA leadership protested but it would not be enough. The VFL offer was too good to refuse. Eventually the war meant that neither the MAFA nor the new VFL ‘Junior League’ played from 1916-18. The VFL decision to create its Junior League while the war was in progress demonstrates a high determination. In 1919 the VFL’s ‘Junior Football League’ commenced with Carlton, Collingwood, Fitzroy Jnrs, Leopold, University A, University B, Richmond, West Melbourne and St Kilda. University ‘B’ was apparently a late inclusion after negotiations to include Caulfield (to be aligned with Melbourne) fell through. (Black and Blue p62). The MAFA did not play in 1919, so University ‘B’ was free to join. St Kilda’s team was a new team with players from a variety of local teams in the District. Most of the other teams, apart from West Melbourne (Essendon), were rebadged MAFA teams. The inclusion of University is interesting. Their invitation to join the new league indicates that the League and University club maintained good relations. Not only that, but University ‘A’ came second in the 1919 premiership, University 'B' came fourth. Within two years, both the University teams left the Junior League and returned to the Amateur ranks. Coburg played in the League for a few years before the tumult of 1925 when they joined the VFA. In 1928 the Junior Football League became the “VFL Seconds”. The new Junior Football League slowly became a true VFL seconds competition. By 1922 all 9 VFL clubs were represented with Coburg making it an even 10 club competition. 1925 Leopold became South Melbourne, Coburg exits to the VFA and Footscray, North Melbourne and Hawthorn join. For the VFL a second’s competition where each team represented a senior team, and where professional players could be relegated/promoted at will was a much better system than the ad-hoc arrangement before the war. The loss of so many clubs to the VFL left the Amateurs with only a few clubs left. The key was that a driven Adamson was still in charge and dedicated to amateurism. Rather than bow out or join another competition, Adamson started to rebuild the MAFA around the Amateur ideal. In 1920 the MAFA restarted with new look competition included four pre war teams and four new teams. Of these pre-war teams Elsternwick had only joined the MAFA in 1914. And South Yarra, with links to St Kilda, would only play two more seasons. The old teams were Collegians, Elsternwick, University (B) , South Yarra and the new teams were Old Caulfield Grammarians, Teachers College, Melbourne Swimming Club, Old Melbournians). The 1920’s saw the Amateurs recruit heavily to their ranks. Rather than repeat what he had done in the late 1890’s when the League rejected applications and looked for a small group of strong teams, this time the decision was made to recruit widely and by 1930 the MAFA had thirty teams in three divisions with a promotion/delegation system between the divisions. Most clubs had only one team, but some of the larger clubs had multiple teams, usually in different divisions. The main exception to the rule was the University club. While in the VFL, University had a Second’s team in the MAFA, now having left the VFL, both University teams were in the MAFA, and both often competed against each other in the first division. Rather than remain as firsts and seconds, the University teams developed separate identities as University Blues and Blacks. In 1932 the popularity of the League had increased so that yet another division ‘D-Division’ was added. In June 1925 the Amateurs played their first Interstate match (as opposed to interleague match) when they took on South Australia where they won convincingly 21.22 (148) to 8.10 (58) at the MCG. Interstate co-ordination resulted in Interstate Carnivals and regular interstate matches between the amateurs in the following years. 1928 A motion from Mr. Hosking to change name from MAFA. to the Victorian Amateur Football Association (VAFA) which was soundly defeated. In 1932 there was again talk of name change but it was not until after the death of its long serving president that year that the MAFA finally changed it’s name to the VAFA.22 The renaming of the competition to the VAFA gave the competition the name it still uses today. The ugly break between those supporting an amateur ideal and the increasingly professional VFL football world is illustrative of the different views of sport within the Melbourne community, but it is hard to say that the end result left football worse than it was before the break. The VFL Seconds competition, later named the Reserves became an integral part of VFL club structures, without the issues that an amateur competition brought. The MAFA transformed in the 1920’s into a thriving multi-tiered competition which continues to be a key part of the football landscape. Before WW1 the VFL clearly changed direction from its support of amateur ideals to a drive toward professionalism. The rise and fall of University and the split with the MAFA illustrate this change. The First World War can be seen as a clear marker in the direction of VFL football. 3. When the VFL began organising their district competition, Caulfield City was intended to be linked to Melbourne F.C.